The CDC has reported an alarming statistic, suicide rates have increased 30% since 1999, and only about half of those had a known mental health condition. Depression was previously thought to be the major cause of suicide up to this time. The Centers for Disease Control said while many cases of mental illness have been diagnosed in suicide victims, factors like relationship problems; financial stress and substance abuse also were contributors to the increase. From 1999 to 2015, suicide rates increased among both sexes, all racial/ethnic groups, and all urbanization levels,” the CDC researchers wrote in their report. The report found that almost no group is excluded from the rise, except for people over the age of 75. “Middle-aged adults had the largest number of suicides and a particularly high increase in suicide rates. These findings are disturbing,” said CDC principal deputy director Dr. Anne Schuchat. In 2016, 45,000 people were victims of suicide according to the center’s findings. Originally when tracking the study, researchers were trying to find state statistics, but uncovered a much more popular trend than originally noted. One state that had no increase in suicide rates was Nevada, but the silver state has long been one of the states with the highest suicide rates in the country. “A key thing that we focused on was looking at individuals who committed suicide, comparing those with mental health diagnoses with those who didn’t,” Schuchat told NBC News. Some say finding and receiving appropriate and affordable mental health care can be difficult, which would contribute to the number of those who committed suicide with no documented history of mental health. Economic downturns also seem to play a part in the hike. And certain states were effected more than others, Suicide rates increased in mostly Western and Midwestern states, including Montana, Idaho, Wyoming, North and South Dakota and Minnesota, as well as Kansas and Oklahoma. After digging through the details of suicides in 27 states, the CDC was able to include more details and factors that contributed to the suicides and discovered. The CDC advised policies that could possibly help lower the amount of suicides in the country. 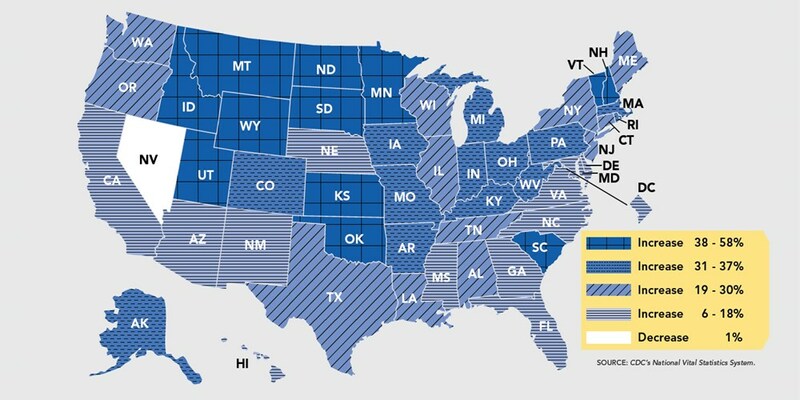 States can help ease unemployment and housing stress by providing temporary help. Health care systems can offer treatment options by phone or online where services are not widely available. Communities can offer programs and events to increase a sense of belonging among residents. Schools can teach students skills to manage challenges like relationship and school problems. When and if this will be implemented or even considered is yet to be determined, but when an increase like this is so alarming, and everyday people and celebrities alike are falling victim to the permanent decision, these numbers cannot be ignored.